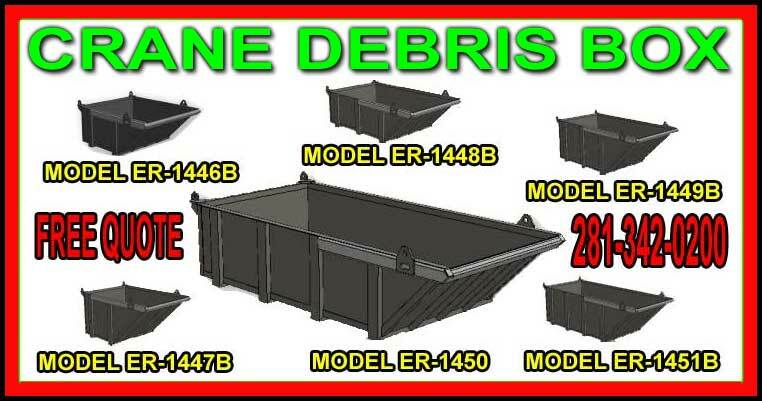 Our Heavy Duty Crane Debris Box attachment with big lifting eyes has plenty of capacity to handle most any kind of waste or bulk construction trash. Manufactured with heavy steel and reinforced at all stress points to guarantee a long helpful life. Engineered to be lifted with a set of 10 ft. or longer cable or strap slings. The sloped end of the skip makes it safe and easy to dump the load. Avnix debris box crane facilitates easy removal of “Tare Off” or other construction waste material from roof tops and elevated decks. ER-1447B CRANE TRASH SKIP 3’D X 4’W X 6’L – with lifting eyes 2.0 cuyd. 7,000 lbs. 1030 lbs. ER-1448B CRANE TRASH SKIP 2’D X 4’W X 8’L – with lifting eyes 2.0 cuyd. 7,000 lbs. 1114 lbs. ER-1449B CRANE TRASH SKIP 3’D X 4’W X 8’L – with lifting eyes 2.9 cuyd. 10,000 lbs. 1262 lbs. ER-1450B CRANE TRASH SKIP 2’D X 4’W X 10’L – with lifting eyes 2.7 cuyd. 9,000 lbs. 1303 lbs. ER-1451B CRANE TRASH SKIP 3’D X 4’W X 10’L – with lifting eyes 3.8 cuyd. 13,000 lbs. 1494 lbs.